1. Briefly describe yourself. When and how did you first become interested in art? How long have you been a practising artist? I became interested in aboriginal art since the time that she was working as assistant teacher at the Yuendumu school; and has been practising from 1987. 2. What is important to you in your art? What are you aspiring for with the art that you create? 3. What do you find to be the most exciting and challenging parts about being an artist? When I am doing a very large canvas I really need to think about the colours and how the painting will look at the end, to have the composition of the painting in my head so when it comes out is what I want to show. To be able to find a way to work that reflect what I want to show in that picture. 4. 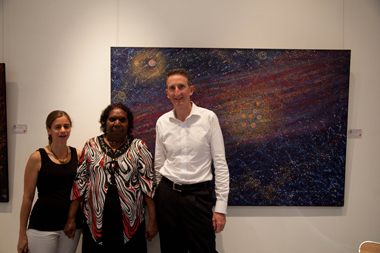 What are the growth or evolutionary opportunities for Aboriginal art in the society you live in? From the elders and in particularly from my father, mother, grandmother and grandfather I have been able to learn about the story that I am painting and the they have given me the knowledge of the culture and the right way of depicting a very important part of our culture and traditions, they are the one that have pass on the information as all this stories and traditions are kept in the minds of the Warlpiri people. Our Culture comes from an oral tradition where song, stories, dances, ceremonies and the country are interconnected all of them are crucial for the continuation of improving of my art. 5. 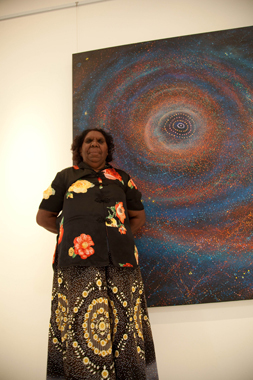 In your opinion, what role does a contemporary Aboriginal artist have in the society you live in? I think it is important as an aboriginal artist to maintain my culture and tradition and to be able to pass on the knowledge that was pass on to me by my family. But also is important that I am able to make an income from my painting and I am able to support my extended family with it. 6. Who have been your greatest heroes in helping you take this creative path? How did they influence you? 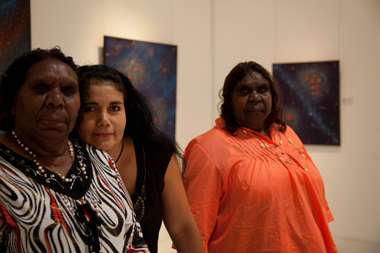 Warlukurlangu Artists has helped me to realise my potential, they are always there for me when I need any help, in the technical aspects of painting and in personal matters. My family also has supported me through my painting carrier. 7. Which artists do you find inspirational? 8. Describe the space that you work in? I work in the Gallery space of Warlukurlangu Artists. 9. When do you feel most creative? In the morning after having a god breakfast and after a long night looking at the night sky. 10. What do you want people to take away with them when they see your art? I want them to see that I have an important culture and tradition and I am able to show this in many different ways. I want them to have a little piece of my life and my country. 11. Tell us about the last artwork you created and what was the story behind it?